The much anticipated, next-retro-edition of the Bond franchise is just around the corner! With it comes the likewise antcipated score by composer DAVID ARNOLD. 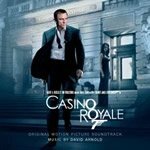 Bond is back with a sensational score to match one of the most highly anticipated and thrilling films of the year, in the Original Motion Picture Soundtrack for Casino Royale. This amazing soundtrack is composed by Grammy Award®-winning composer David Arnold, who has worked on soundtracks for films such as Independence Day, Tomorrow Never Dies, The World Is Not Enough, Godzilla,etc.